• 1,000 sq. ft., 1 bath, 2 bdrm lot / land "Plus 2BR Home" - MLS® $69,000 - Large Lot - Small Price!! 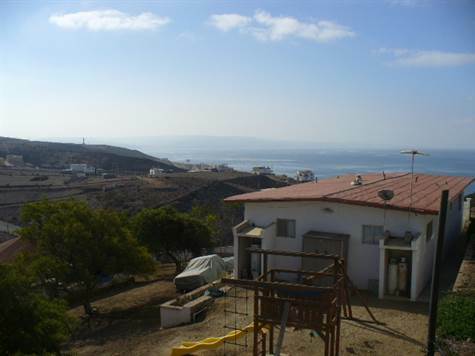 Popotla, Playas de Rosarito - Great value for a large property that is priced at only $86 per square meter which is under the price you would typically pay for raw land in this development. With this property, you get an 8600 square foot (800 square meter) manicured lot, landscaped with fruit trees. There is a septic system, a fresh water tank with electric pump in a brick storage building, two electrical circuits for plenty of power and a 1500 square foot, bi level, two bedroom home! When standing in the family room, you have a panoramic ocean view looking down the coast south of the historic Calafia Resort and looking east, you have a panoramic view of the hills east of Calafia. The handyman special home has plenty of room for expansion and is located in the established neighborhood of Terrazas del Pacifico which is just east of the Fox Movie Studios. There are many large properties with big homes in the area and many of the residents live here full time. It is common to see horses, mules and cattle grazing in the neighborhood and in the hills because only about 40% of the lots are developed. When you want to get out and play in town, it is a short 10 minute drive to downtown Rosarito where you have an abundance of restaurants, shopping, services and nightlife. When you leave to cross the border, the new Boulevard 2000 is just minutes away which is a short cut to the faster Otay Mesa Border. The Otay crossing allows you to sneak back to San Diego avoiding the traffic at the main Tijuana/San Ysidro border crossing. This move in condition property is bank trust ready. Fast, easy and ready to move in, this place is a great value. Call or email for more information and to set an appoint to come and see all that is Baja!